Instagram model Mara Teigen gained some fame when she and her huge lips appeared in Kylie Jenner’s lipgloss commercial. She is also noted for her resemblance to Angelina Jolie, which we don’t quite see. 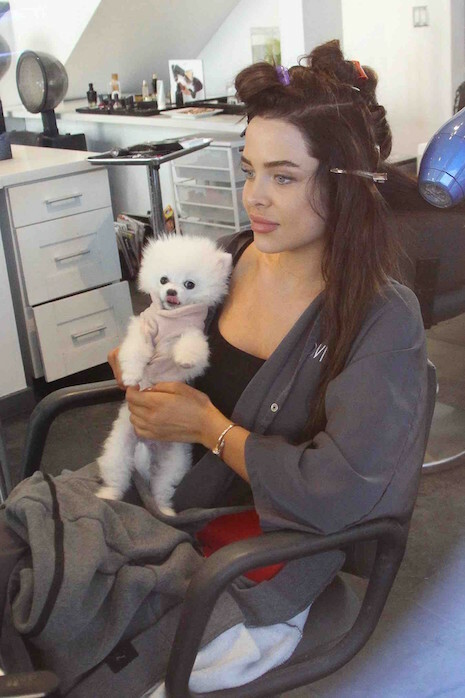 She was photographed in a Beverly Hills hair salon today and apparently she’s got plenty of money – she paid $9000 for that adorable teacup Pomeranian on her lap. “Miss Amazing,” as Mara calls her pup, only weighed 1.2 pounds when Mara acquired her, and may never reach 3 pounds. As we recall, Paris Hilton started the designer dog trend in Hollywood.